What are air cylinder cushions and how do you apply them? Air cylinders can have a mechanical cushioning system that is used to reduce the internal impact of the cylinder piston as it reaches and hits the end caps of the air cylinder during normal use. Over time, and depending on the air cylinder cycle speed, this repeated impact of piston to end cap will cause cylinder damage. One common result of the cylinder piston slamming into the end cap inside the cylinder is a fracture of the rod thread that screws into the piston center. A result can be stress cracking and ultimate failure of the piston itself. I am a strong proponent of using the rod end tooling outside the cylinder to stop the piston travel inside the cylinder before the piston can reach or impact on either end cap. I believe that this will increase the life of your cylinder substantially in high cycle speed applications and external shock absorption is preferable to internal air cylinder cushions. There are many methods of reducing impact, including external shock absorbers or internal bumpers. These options will be covered elsewhere on this site. Air cylinder cushions have a variety of designs, depending on the cylinder manufacturer. The graphic is not to try to show how all cylinder cushions are designed and built, but rather, to provide information to help understand the concept of air cylinder cushions. In the graphic, you can see this piston has been machined with cushion spears on both sides of the main piston. The piston is depicted as moving towards the blind end or rear end cap of the air cylinder. The cushion spear is the wider part of the piston rod, adjacent to the piston. The cushion spear will enter the cushion receptacle, the hole in the rear end cap in the drawing, before the piston itself can reach and hit the end cap. There are seals around the hole in the cushion receptacle, and these seals trap the air that’s in the cushion receptacle as the cushion spear enters the orifice. This prevents the trapped air from exhausting out through the cylinder exhaust port, along with the rest of the air on that side of the piston. There is a small air passageway that leads out of the cushion receptacle to atmosphere. This small airway allows a controlled exhaust of the air that has been trapped by the cushion spear. This trapped air is slowly (relatively speaking) vented to atmosphere through a cushion exhaust outlet. Some of the cushion exhaust vents are fixed size, meaning the air cylinder piston is decelerated the same way every time, or they can also be adjustable allowing the operator to vary the deceleration of the piston predicated on the cylinder speed, the load, and the cycle rate necessary for the machine. All cylinder cushions trap air and vent it to atmosphere through an integral air passageway. Not all cylinder cushions are adjustable. If they are adjustable, usually the adjusting screw is “captive” and cannot be screwed fully out. 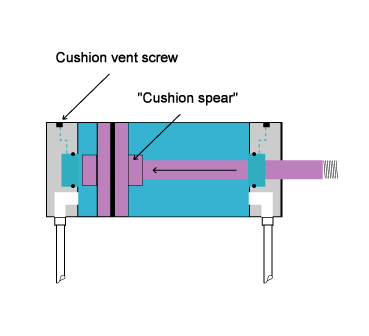 The adjustable kind of cushion vent screw is a needle valve with which an operator can increase or decrease the speed of the air venting from the cushion receptacle. While reasonably effective at reducing the potential for air cylinder damage, the downside of air cushions in cylinders is that the cushions will slow the cycling of the cylinder. If the application requires high speed cylinder cycling, cushioning the piston in this manner will not provide satisfactory results. If cycling speed is the issue on a particular piece of equiopment, another method of preventing damage to the cylinder end cap will be required, and that includes the external stops referred to earlier in this article.